Digital outreach is a key aspect of today’s political and advocacy campaigns Online tools including blogs, social networking sites like Facebook, Twitter, YouTube and other online organizing and communications resources are important for getting campaign messages out to a broad audience of potential voters or stakeholders. This session will provide an overview of best practices and offer practical tips on how to get started or enhance your online presence. * Track 1: I'm Ready to Run, Now What? Track 1: I’m Ready to Run, Now What? for women planning to run for office immediately. Track 2: I’m Not Ready to Run Yet, But…for women who want to learn more about different ways to get involved in politics or position themselves for public leadership. The Ready to Run® Diversity Initiative programs aim to increase the participation of women of color in New Jersey Politics. 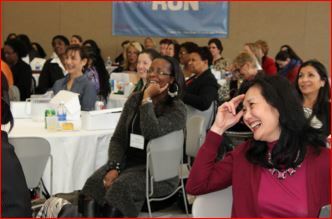 Diversity Initiative programs are held on Friday, March 15th, immediately prior to the opening Ready to Run® session. Directions to the Douglass Campus Center can be found here. Nearby Accommodations: Please note that this list is provided for informational purposes only. All participants are responsible for their own lodging reservations. Please check with the hotel for current rates. Interested in becoming an exhibitor? Download the form here. We rely solely on grants and donations to provide scholarship funding to program participants. At this time, a small number of scholarships are available. To apply, please complete the registration form (answer the question about scholarship funding), and we will follow up with you. For more information, contact Pooja Prabhakaran at 848-932-8566 or by email at pprabha@eagleton.rutgers.edu.